The SEO landscape has changed drastically in the past year or two. This article provides updates on what is important, and actionable “non-techie” take-aways to ensure success. Moz Inc., a Seattle-based SEO consulting company, completed a study recently that the most important factors for SEO success now include mobile-friendliness, which will increase in impact by 88%; analysis of a page’s perceived value (up 81%); usage data such as dwell time (up 67%); and readability and design (up 67%). SEO factors that the study reported will decrease in impact are the effectiveness of paid links (down 55%) and the influence of anchor text (down 49%). It’s now less important to include keywords in headlines. Google has gotten better about interpreting meaning. Until now, if you wanted to rank for “Best Car Dealership,” you’d repeat that several times in your content. Now you can talk about great service, excellent new and used car inventory, and include testimonials to that effect. The semantic meaning is becoming more important, and the search engines understand that now. It’s no longer so necessary to focus on just the most obvious keywords in the content and meta description. While using the right keywords still has merit, much has changed. As search engines get smarter, they start to think about other words that they expect to be in your content, what will signal that this is an authoritative article on the topic. So, what are the actions you need to take to ensure SEO success in 2017 and beyond? Make sure you are creating new content on a regular basis that is meaningful and important to your target audiences. It’s not just written word content – this includes infographics, photography, videos and so on. 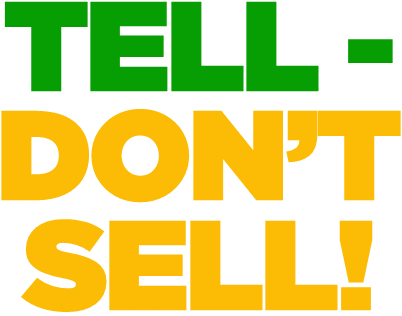 I often use the expression “Tell, Don’t Sell.” This means you are providing content that is useful and relevant to your audience, and not a sales pitch about how great your company is. Create an annual editorial calendar so you know exactly WHAT you want to say, WHO you are targeting, WHEN it will be launched online and WHO will create that content. That last point about WHO will create the content is an important question to answer. Be realistic about the availability and skill sets of your in-house staff to get the job done. If you post poorly-written and unprofessional content, it not only reflects badly on your brand, it also can result in a higher bounce rate when a visitor realizes it’s not what they expected. And that bounce rate is one of the criteria Google is measuring. A high bounce rate tells Google “this isn’t great content and people don’t like it” – so they’ll rank you lower in the search. Proofread for errors: the ease of pushing content onto the Internet and social media has resulted in sloppy grammar and spelling errors. Let others take the low road – check and recheck your content before posting it to ensure you are viewed as professional and knowledgeable. 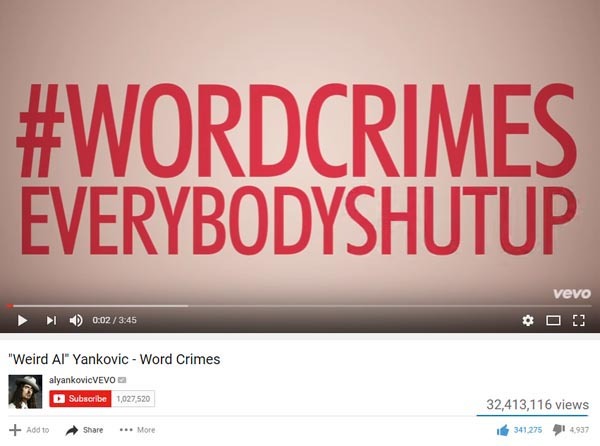 While not everyone may appreciate the humor or Weird Al Yankovich, his video parody of Robin Thicke’s “Blurred Lines” – entitled “Word Crimes” – is priceless, and provides great reminders of the importance of written word. 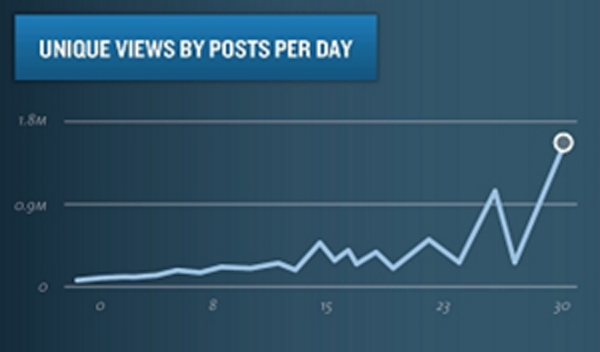 Keep it short: visitors skim more than read. Use bullet points. Get to the point, and don’t force visitors to read through paragraphs of content to get to the information they were looking for. Be conversational: write for your audience, and provide content that is easy to read and engaging. Use images: use easy-to-digest infographics, great photography and other graphics to increase the visual appeal of your site. Create internal links: if an article gets long, split it up with links to related pages. Write great headlines: if they don’t like the headline, they’ll probably move on. Your content = Their action: your content should be actionable, giving the readers a clear understanding of what they should do. Cite your sources: if Google thinks you’re using other sites’ content without attribution, it will hurt your rankings. As I have done in this article, include links to your source of information. Create more landing pages: a study conducted by HubSpot revealed that companies with 40 or more landing pages get 12 times more leads than those with 5 or fewer landing pages. Rather than sending visitors to your home page, identify your various target audiences and develop separate landing pages just for them. That landing page will contain the tips, jargon, images, and ideas that are highly relevant to their world. Create more internal links: as I said above, split up bulky content into more pages. If they are interested in the first article, then they are more likely to stay on your site and read related topics – which the search engines like to see. Take a look at what recipe websites such as allrecipes.com do: here’s an image of a cake recipe page, and they give the visitor lots of reasons to stick around – if they like this cake recipe, they might love these others. 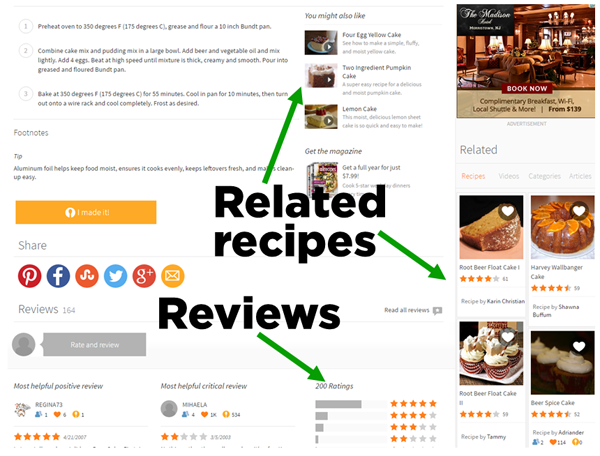 Or they’ll read the reviews to see what others are saying, which might lead them to other related recipes. Create a clear call-to-action: one of the easiest is to include an email sign-up form on every page. Or, you can offer free trials of your product or service, or limited-time price discounts. This is just for consumer products – try this with B2B services as well! Test the call-to-action button – is it large and “overt?” This is especially important in this mobile world. This is one of – if not THE – most important steps to take. It is now absolutely critical that your site is optimized to be easily read on all smart phones. April 21, 2015 was the date that Google launched the algorithm that used mobile-friendliness as a key factor in search results – read the article here. Since more than half of your visitors are likely to be viewing your site on a smart phone, you understand why this is important in SEO success. If they go to your site on their iPhone, and find they must pinch and scroll and squeeze to find what they want, or can’t click on a call-to-action because it is too small, they will bounce. So you’re being hit twice in Google’s eyes – your site isn’t mobile-friendly AND visitors are bouncing out. In conclusion, it’s no longer about being #1 or #2 in search engine results. It’s about giving your visitors a great experience. 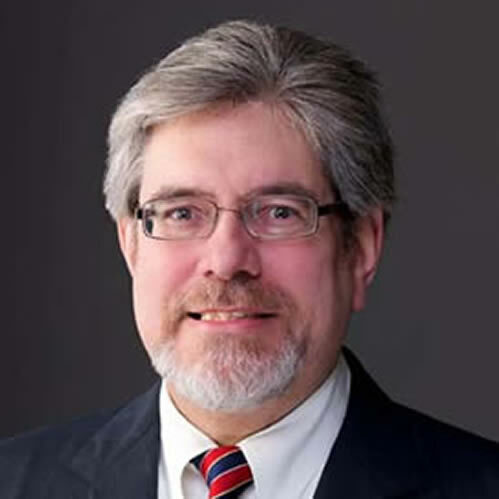 If your business needs support in ensuring a great user experience and improving SEO, call me at 717-368-5143 or email me at Mark@VogelMarketing.net.